Sources of Reference | Innovation, Inspiration... Atlas Unleashed! Everyone who endeavors to work in the field of illustrative or storytelling art reaches a point where one obsesses over what are the best tools to use in the application of their art. I remember vividly thinking that I’d found the secret to success when I discovered the Rapidograph. Then it was the design marker. Then the Windsor-Newton sable haired brush. Then it was which India ink to use with your fancy shmancy Windsor-Newton sable haired brush. Then I nearly went apoplectic when I stumbled upon… Dr Martin’s concentrated dyes…YES, the magic elixir that produced the glorious color that the comic book industry wasted for years on that crappy newsprint they were using. But it wasn’t until much later that I discovered a different type of tool that’s at least as important as any of these others if not more so. 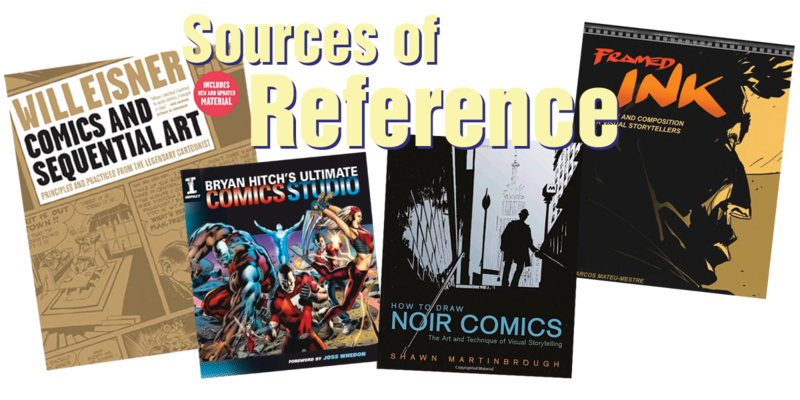 That being: SOURCES OF REFERENCE. These sources can take many forms. There is, of course, photo reference or the study of nature. It can include checking out scenes from TV shows or movies or books. There are many books devoted to the storytelling process. Comic books themselves can come under this category especially the works of legends like Eisner, Kirby, Adams, Kane and Toth to name a few. But what we want to focus on today are the” How To” books. Basically you should look at whatever book addresses your particular needs but I’ll give you a list of the ones that have served me well over the years, not just in comics but animation storyboards as well. Let’s start with Will Eisner’s COMICS & SEQUENTIAL ART. If you have this book you have the basic college class Will taught at School of Visual Arts. It discusses the thinking behind the storytelling process. The greatest imagery in the world means nothing if it doesn’t work in the service of the story. Simply put, this book shows you how to apply and combine words and images as a singular language. A more recent book, Shawn Martin Borough’s HOW TO DRAW NOIR COMICS focuses on a particular as pect of storytelling, light and shadow. This will give a lot of insight into the staging on a panel, the importance of spotting blacks to create mood and establishing and being consistent with your light source. FRAMED INK by Marcos Mateu-Mestre serves a similar purpose and expands into the realm of storyboard design. Both of these books are great at helping you improve your picture making. Process is very important. What’s that you say? Well, your process is how you get from initial thumbnail or l ayout to the completed page. Brian Hitch’s ULTIMATE COMICS STUDIO is all about that. Using, of course, his own studio set-up he goes through his process to give you a detailed step-by-step instruction on how one of the top guys in the business gets from that thumbnail to a finished product. Illustrated lavishly, it’s a great book to have. So you wanna be a colorist? Wanna show Laura Martin and Adam Hughes how to really make Photoshop stand on it’s head? Well do ya, punk? (Sorry, I channeled Dirty Harry for a moment… I have no idea why.) Well, you’ve got two books to obtain. You can go out and buy DC COMICS’ GUIDE TO COLORING/LETTERING. A great book on the subject of all things digital or you could try to follow Mark Mazz home. I’m sure he’ll be thrilled to have you and would be equally instructive. Gary Martin’s book on inking is very helpful, and it offers sample pencils for you to ink over. There’s another option there as well. You could follow Mark Morales home. No on second thought…just don’t. Trust me. And finally for all you animation fans out there there’s Ben Caldwell’s ACTION CARTOONING BOOK!. I use it whenever I feel like my work is getting a little stiff or want to inject humor into a pose or scene. Rhythm and expression are essential to animation drawing. if this is a concern of yours, and it should be, this is the book for you. Last but not least there’s Bruce Timm’s BATMAN ANIMATED book. When I first saw this on the shelf, money leaped from my pocket unbidden. Simply put, not only does it have tons of great Bruce Timm art (not to mention Ronnie Del Carmen and Darwyn Cooke art), it touches on every part of the animation process. Especially helpful to me was the storyboard work. Get it while it’s still in print!. Well, I think I’ve gone on long enough for now. Hope you enjoy my suggested tomes. I sure have.